Do you know that Daylight Saving Time is also known as “Summer Time”? The only thing I can vividly remember about this past week is the snow/rain and the cold. Oh March, what happened to thee? Aren’t you supposed to be the first month of spring? So what about this icy wind whipping at your face every time I step outside the door? I think you and I need to sit down and have a calm discussion about this whole thing. I need to understand what you on about. While we wait for the world to defrost, I think we should cook up something delicious. Because, nothing boosts my mood like delicious food. Lemme tell ya, these are kind of a big deal. Kofta is a Middle Eastern/Indian/Balkan traditional recipe for meatball/meatloaf. In the simplest form, koftas consist of balls of minced or ground meat - usually beef or lamb - mixed with spices and/or onions. These ones are made with turkey and zucchini and pistachios and scallions and garlic and basically they’re super good. 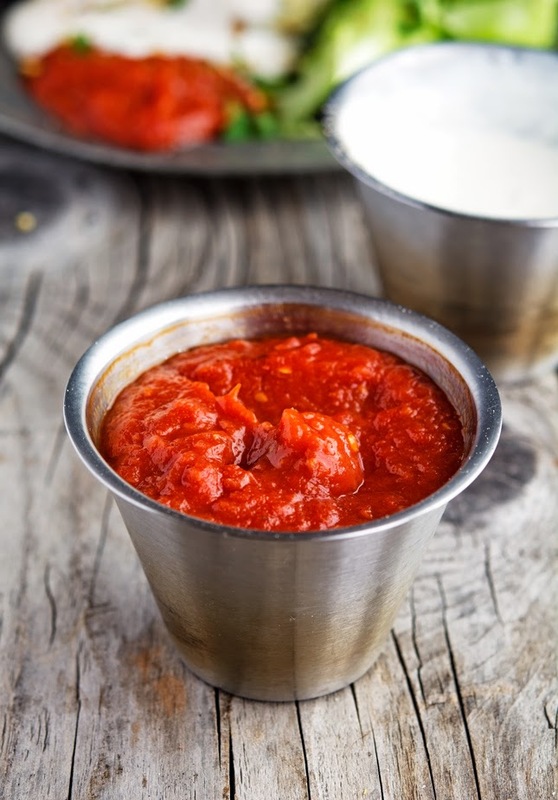 What about this Roasted Red Chili Sauce? It’s like a sophisticated grown-up version of catsup. It’s deliciously sweet with just the right amount of spiciness and a light smoky flavor that is to-die-for. It has the wow-factor in abundance and when it’s paired with that Tahini Yogurt it’s pure bliss. 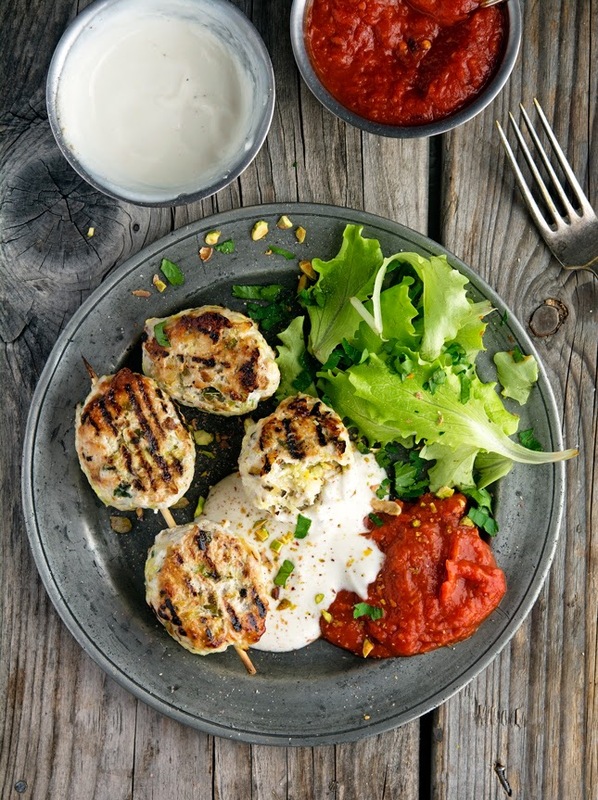 These Turkey Koftas with Roasted Red Chili Sauce and Tahini Yogurt have become an absolute favorite. It’s a slightly unusual combination of flavors — you may even call it exotic. I love 'em because they pack a serious flavor punch. Definitely not short on awesomeness. I’ve made this dish twice for my family/friends and they raved over it. I’ve had many requests for the recipe — a great sign that it's a hit. So posting it was the right thing to do. And now I’m happy again — who cares if all-time March record lows are likely to be broken this morning. I told you good food always equals good mood. Just so many good and warm vibes right now. 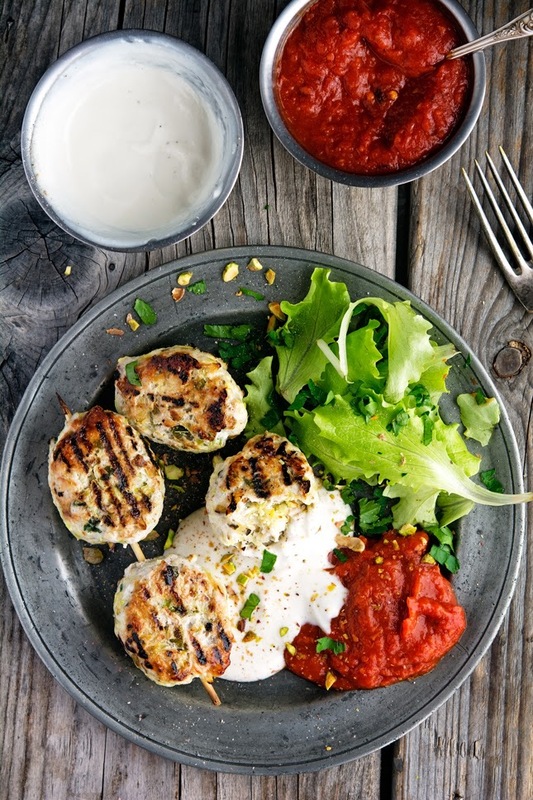 Turkey Koftas with Roasted Red Chili Sauce and Tahini Yogurt Print this recipe! Note. You may find easier to grill the koftas without skewers, I prefer to use the skewers but it’s a matter of personal preference. Place red chiles, halved tomatoes, halved onions, and garlic on a baking sheet. Drizzle with olive oil and sprinkle with a bit of salt. Remove from the oven and let cool for a couple of minutes. tomatoes, sugar, tomato paste, and vinegar. Season with salt and pepper and pulse until smooth. Combine yogurt, tahini, lemon juice, cumin, and salt in a small bowl. 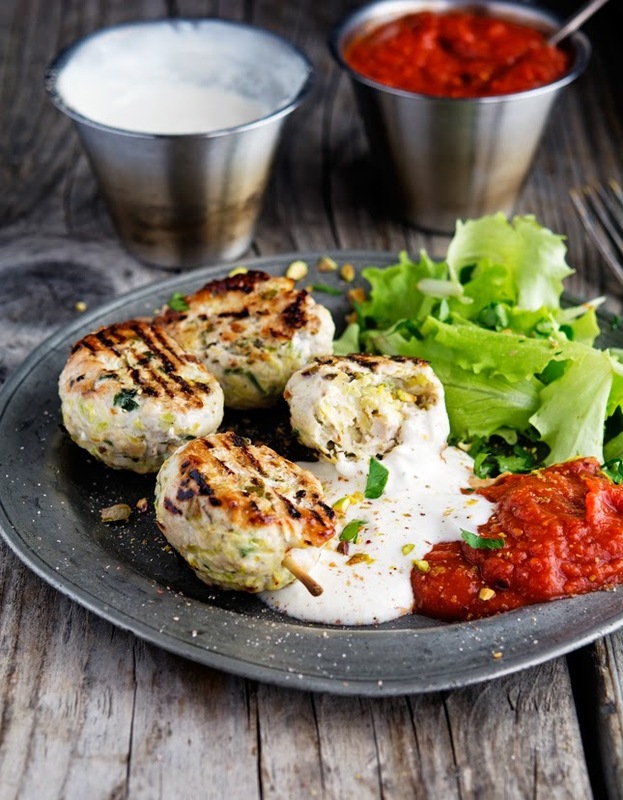 Serve turkey koftas with roasted red chili sauce and tahini yogurt. 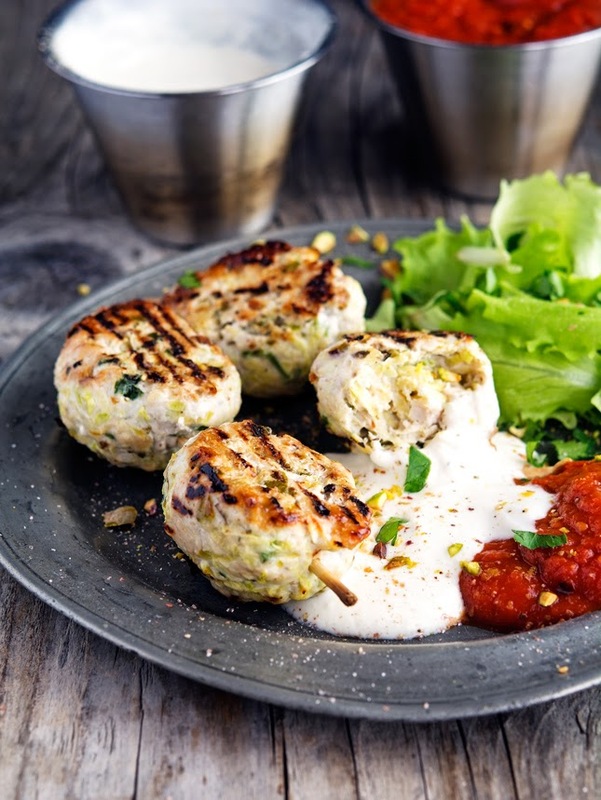 One “naked” kofta yields 78 calories, 4 grams of fat, 1 gram of carbs, and 9 grams of protein. One “dressed” kofta yields 122 calories, 7 grams of fat, 5 grams of carbs, and 10 grams of protein. You are right Mike - this cold weather makes it hard to adjust to daylight savings time! We were in the 70's on Wednesday here in Atlanta, then in the 20's this morn!!! GAH! But - kofta like this would makeup for the cold! These sound fantastic with the pistachios in them! 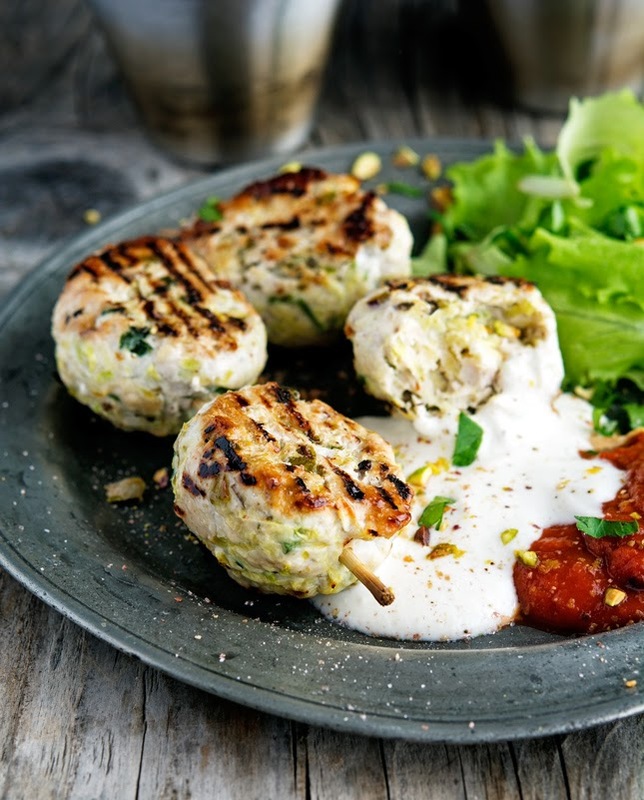 Pistachios are such a fantastic add-on to koftas, you have to try it! This looks so good especially that roasted chili sauce. So yummy! I love koftas! It is the only think I order at one restaurant and if I ever order anything else I'm always sad it wasn't the kofta. these look really fantastic. high five! Hi Mike, Love everything about these!!! In Arizona the time never changes, I was born in Ca the time change is part of the season change, this might sound weird but I miss it. Love koftas- Mum used to make them calling them Persian meatloaves (like a typical Persian, thinks they invented everything). 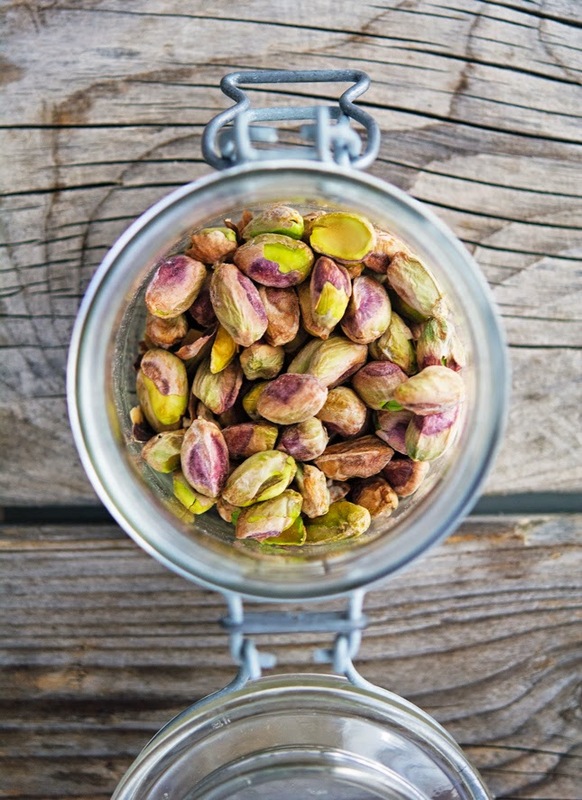 Never tried it with pistachios though- Great idea (The Persians invented them too). Fall is my favorite season too man, especially here in NE. I mean, can we talk about the foliage for a moment? Best.Thing.Ever. What kind of red chiles do you use? This looks fantastic! I make koftas quite often and the addition of the shredded zucchini is brilliant! Keeps them moist for sure. I'm loving both sauces, especially with the roasting of the veg and cumin addition. Nice dinner for a cold wintery Spring indeed! The roasted red chili sauce was soooo good! I had chicken burgers (with pita breads) with both sauces, delicious! That's awesome Lara, I'm so glad you enjoyed it! I do not appreciate this time change at all:(. Your kofta plate is so good looking, healthy and delicious. The roasted red chili, yum.